I would like to start a new section of the photo album section of pictures of Cletrac and Oliver dealerships. If you have any pictures of dealerships - either old pictures and/or how they look now - please send them to me and I will put them up on the site. Please give as much information as you can about the dealership and the pictures. Gerald J Mahoney was a Cletrac dealer and is pictured on the left in the #13 car. Photo was taken at the Vincennes Races 1919 in Knox County, Indiana. Note Ã¢â‚¬Å“CletracÃ¢â‚¬Â� painted on the hood of the car. Shuey's Sales Service Jonestown Road, Ono, PA 17077 Tel: (717) 865-4915. They were an Oliver & Cletrac dealer since 1914, servicing and selling farm, lawn and garden machinery in the Lebanon Valley from their store in Ono for four generations. Thanks John... I will check these out. I'm behind on my photo updates. Hi Blake I have been very lucky and found a Herc motor for my AD. But when we where there, the old guy produced a book from Britstand dated 1954, they were the main manufractures of machinary and importers here in Aussie. It listed a number of dealers thoughout Australia, the book had a photo of there factory in Mascot Sydney. They boasted they were the largest manufacture in the Southern hemispere. Also photos of Cletracs and other machines. I am going back soon to see him again and will try to get a photocopy of it for you if you are interested. Thanks Willo, that would be great. See if you can borrow the original and scan them as photocopies seldom come out good enough. But get what you can. 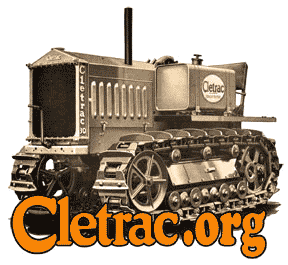 Have also found great site here in Aust, that has approx 100 images of cletracs in Aust. Don''t know if you are aware of it or not, the site is www.pictureaustralia.org just type in cletrac in search box. Those are some great photos! I really enjoyed seeing them. I've never come across them in my internet searches. I just found a set of drawing for the ware loader. They were with the OC-3 I got from my father-in-law. The drawing plates are dated 1952 & 1953. Are these someting that are common or worth posting to the list? These appear to be the machine drawings for manufacturing assembly, not sure.